What Is A SSA 3373-BK Form? SSA 3373-BK also known as the function report adult, is the document that has to be prepared after a Social Disability claim. After you are interviewed, you will be asked to complete a special form. This is the first real sign that your application is being considered earnestly. To fill out and formalize the paper correctly you may consult an attorney or another competent specialist firstly. You may use an online template and type all the required information. Thereafter, the file should be sent to the Social Security person in charge. After you have found the appropriate form, read carefully the attached instruction. SSA 3373-BK consists of ten pages and five sections. The first one requires basic details regarding your personal data. Section B contains questions about your disabilities and how they prevent you from usual activities. The next part is intended for information that has to show your ability to cope with some everyday tasks. There may be questions whether you care for pets, how do you sleep, what is your schedule and so on. Thereafter, it comes specifically to determination of your feasibility to perform some kinds of job. Finally, you have to add any information you consider as necessary to clarify some positions. 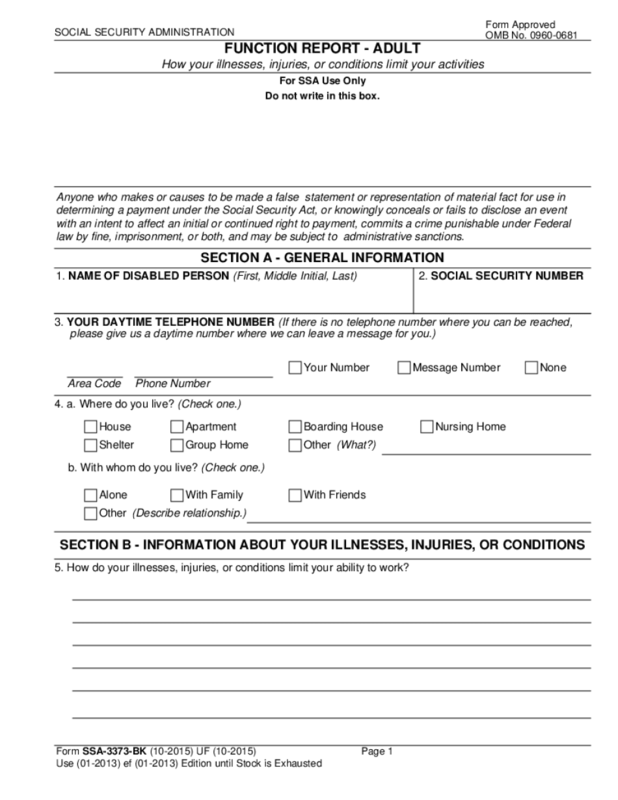 Once you completed, sign the SSA 3373-BK form and forward it to the recipient. You can create the file as well as share it by any Internet-connected device. These may be computers, laptops, tablets or smartphones. You may also print out the blank and fill it by hand. Just in case, make several copies.